The radar image of Mercury’s north polar region from Image 2.1 is shown superposed on a mosaic of MESSENGER images of the same area. All of the larger polar deposits are located on the floors or walls of impact craters. Deposits farther from the pole are seen to be concentrated on the north-facing sides of craters. Image released Nov. 28, 2012. 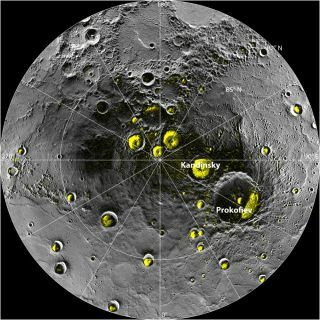 Mercury likely harbors between 100 billion and 1 trillion metric tons of water ice in permanently shadowed areas near its poles, scientists analyzing data from NASA's Messenger spacecraft announced Thursday (Nov. 29). Life on sun-scorched Mercury remains an extreme longshot, the researchers stressed, but the new results should still put a spring in the step of astrobiologists around the world. "The more we examine the solar system, the more we realize it's a soggy place," Jim Green, the director of NASA's Planetary Science Division, said during a press conference today. The observations by Messenger, which has been orbiting Mercury since March 2011, provide compelling evidence that reflective patches first spotted near the planet's poles by the Arecibo radio telescope in Puerto Rico two decades ago are indeed water ice, researchers said. In the coldest parts of Mercury — permanently shadowed regions where temperatures drop to perhaps minus 370 degrees Fahrenheit (minus 223 degress Celsius) — this ice can lie bare and exposed. But Messenger's data also show that much more frozen water is found in slightly warmer areas, buried beneath a strange dark material that acts as an insulator. This dark stuff is likely a mixture of complex organic compounds, the carbon-containing building blocks of life as we know it, researchers said during Thursday's news conference. "This organic material may be the same type of organic material that ultimately gave rise to life on Earth," said Messenger participating scientist David Paige of UCLA. Mercury probably acquired much of its water and organic material the same way Earth did, researchers said — via comet impacts and asteroid strikes. Ice and organics are common on the frigid bodies in the solar system's outer reaches. "There's a lot of water out there, as there is a lot of water around other stars, but at substantial distance," said Messenger principal investigator Sean Solomon, of Columbia University's Lamont-Doherty Earth Observatory. With its ultra-thin atmosphere and proximity to the sun, Mercury is probably not a good bet to host life as we know it. But finding ice and organics there should still inform the hunt for organisms beyond Earth and aid scientists' quest to learn more about how life took root on our planet. "The history of life begins with the delivery to some home object of water and of the building blocks, the organic building blocks, that must undergo some kind of chemistry, which we still don't understand on our own planet," Solomon said. "And so Mercury is becoming an object of astrobiological interest, where it wasn't much of one before," Solomon added. "That's not say to say that we expect to find any lifeforms — I don't think anybody on this table does — but in terms of the book of life, there are some early chapters, and Mercury may indeed inform us about what's in those chapters."